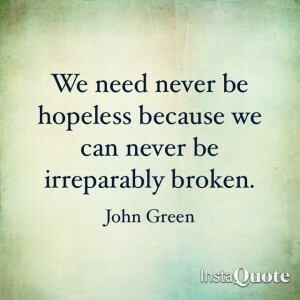 I love this quote from young adult author, John Green. It says so much in a few words. We all have an essence in us that survives even the most tragic or unfortunate circumstances. Stories of holocaust survivors, overcomers of abuse and cancer conquerors are inspiring. Overcoming the odds, persevering, coming out the other side stronger, and other phrases like this cause us to have hope that if we too had to go through something, we could thrive and not just survive. In the midst of struggle we often feel helpless and hopeless. We can be paralysed by fear, or just plain run out of energy. To reach that part deep down inside of us that is still alive, to reignite the spark we once felt, to rebirth our passions and have the courage to start again takes three things, faith, hope and love. We need faith in ourselves. God has created each one of us to have something specific to bring to the world. Have the faith that you were created unique for a purpose and that, no matter what, you can still achieve that. We need faith that there is a God, a force bigger than us, who has everything in control, even when we doubt or filled with unbelief. We need love. The love of those around us: friends, family and community is crucial to unleashing hope. We need a cheer squad-even if it’s a squad of one. God can be our biggest supporter, but we need the warmth of flesh and blood. The right people around us can love us through our situations and hope can rise. We all need hope. Without hope, our soul becomes sick. Nothing is joyful, we can’t even enjoy the moment. Hope gives us the capacity to live in the now, without seeing what we hope for. Loss of hope causes us to see life as purposeless and meaningless. A blend of faith, hope and love weaves a pattern into our lives that will sustain us even during the darkest of times. Having hope doesn’t mean we don’t struggle. Dr. Brené Brown’s book, Daring Greatly encourages us to dare greatly: to embrace vulnerability and imperfection, to live wholeheartedly, and to courageously engage in our lives. When it comes down to it we need a whole lot of faith, love and hope. Faith means believing the unbelievable. Hope means hoping when everything seems hopeless.